Why are Industries Using Flange Guards & Spray Shields? What Are Flange Guards & Safety Spray Shields? What are Flange Guards & Spray Shields? Why are Flange Guards And Spray Shields used? In any piping system, there are numerous joints and threaded fittings in the form of flanges, unions, T joints and elbows, sockets or expansion joints. Other than that, there is a lot of equipment like heat exchangers or pressurized valves installed to control the flow of service liquids. These joints are subject to heavy stress associated with mechanical vibration and wear due to the pressure that they are exposed to. This leads to joint failure, and toxic liquids can be sprayed onto unsuspecting workers and expensive equipment in the form of a violent splash of toxic chemicals. This has caused millions of critical injuries resulting in thousands of deaths. Flange safety spray shields are used to protect people and equipment from these catastrophic incidents. 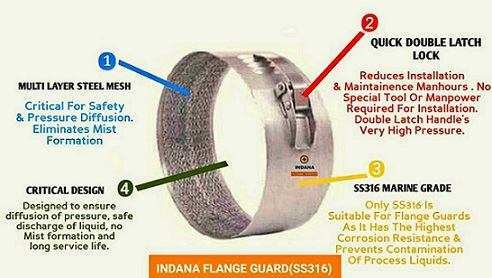 Various government regulations and insurance Requirements make it compulsory for industries to use flange guards. Flange guard commonly known as a Flange spray shield is a safety device designed to contain hazardous spray outs, oil mists & acid splashes. Flange Spray Guards & Safety Shields are installed on Flanges, Pipe Joints & valves. In an event of splash or a spray out, these flange guards completely absorbs the kinetic energy of the splash and renders it completely harmless. This simple hardware has saved countless of lives in the recent time. Flange Guards are available in various material. The choice of material for a safety spray shield or Flange Guard depends on the temperature, pressure & corrosive strength of the service fluid. Flange guards and spray shields are of paramount importance for industrial safety. Flange guards and safety spray shields protect working staff from the spray out of corrosive liquids due to pipe joints, valve and flange failures by containing it. Therefore, reliability and quality are integral elements of any flange shield. All our safety spray shields have a free replacement guaranteed for 24 months against any manufacturing defects. We are the only manufacturers to issue hydro test certificates on demand. Polytetrafluoroethylene is a nonflammable fluoropolymer. PTFE is completely inert to chemical attack making it appropriate for most processed liquids. In spite of properties like low dielectric, non stick, and high thermal resistance PTFE has low mechanical strength which is why acid spray shields of pure PTFE are not used. PTFE is coated on to fiberglass fabric which gives the PTFE coated fiberglass flange leak guard high mechanical strength. PTFE Flange Guards Are Also Known As Acid & Chemical Flange Wraps Or Teflon (TFE) Flange Guards. Our PTFE flange guards, pipe spray shields, and flange shields are manufactured using multiple layers of PTFE with an inner scrim inside. The inner scrim holds onto the flanges and keeps the guard secured. PTFE flange spray guards are stitched with military-grade Kevlar thread which is known for high strength and thermal stability. Most of the PTFE flange guard and safety shields that are available on the market are stitched with cotton or nylon thread which compromises the product’s safety. Braided PTFE coated ropes are used to secure the PTFE flange spray shields onto the flanges. The maximum operating temperature for these flange spray shields is 250 Celsius. These PTFE shields are also known as flange fire spray shields. Using nylon or cotton ropes decreases the PTFE glass fiber cloth shield life and increase your products cost and maintenance. Velcro cutouts are used on opposite sides for fastening the guard. 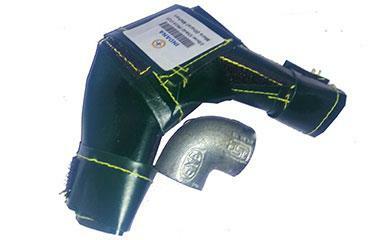 All our spray shields come with a Litmus leak indicating patch in case of a flange leak. This Litmus patch allows for early detection of leaks. The locking mechanism involves a Velcro fastener and drawstring, which allows the guard to be installed by one person. PTFE flange guards and flange covers are exported by us to countries around the world. We keep our profits on the PTFE spray shield very nominal, and our quality is on par with, and at times better than, any flange shield available around the world. The right quality and price mix give us an edge over any other flange shield available in the world. The dimensions of our flange leak guards are sufficient to even cover flanges with flange isolation gaskets and lined pipes. We are a specialized manufacturer and exporter of PTFE flange guards and safety flange spray shields. We export from India to China, USA, Saudi Arabia, Dubai, and Australia at very competitive prices. PTFE flange guards can be used in the most corrosive environment because of their high chemical resistance. PTFE flange guards can also withstand very high temperatures. PTFE flange guards are used in a variety of industries like chemical industry, fertilizer industry, etc. we are one of the leading manufacturers of PTFE flange guards in India. Stainless Steel 316 flange guards have Molybdenum in them which enables them to resist corrosion caused by Chlorides. This is one of the most important reasons that SS316 flange shields and flange protector bands are used in highly corrosive environments, such as near sea shores for flange spray protection. SS316 shields are highly resistant to acid, solvents, chemicals and prevent metallic contamination of process liquids. We are the only manufacturer of this type of SS316 flange safety shields in India. The design is critical to these pipe flange shields because these metal safety shields are used in highly corrosive, high temperature, and very high- pressure environments. All Our SS 316 Flange Guards come with a multilayer stainless steel mesh to decelerate the pressure of the liquid effectively. Safe discharge of the process liquid is the objective of these flange spray shields as a small error can lead to catastrophic accidents in high-pressure and high-temperature environments. 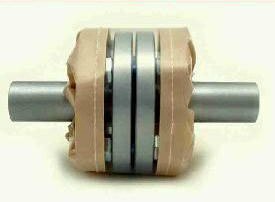 As SS316 flange guards and flange protector band are used in high-pressure environments, we have designed a secured double locking feature for the pipe flange shields giving it adequate safety. We test shields on our own testing rig to figure out any abnormalities arising out of design or manufacturing failures. SS304 flange spray guards with nut and bolts are ornamental in nature and would lead to dangerous lateral spray outs. The safety of our manpower and equipment is important at all times, and this is the reason these SS316 flange guards and flange protector bands are used by industry stalwarts like TATA. We have seen that in a number of industries you require flange shields that can handle reasonable corrosion and limited temperature. PVC is resistant to most of the commonly used acids, salts, and alkalis. These flange guards can be easily used at temperatures below 140 degrees Celsius and are dielectric constant. PVC or Poly Vinyl Chloride has chlorine content which makes flange shields fire retardant. These shields also come in a transparent material that makes a visual inspection of flanges very easy. PVC is safe for human contact and has been used in medical and food storage. PVC flange spray shields have a high degree of strength and what makes them particularly attractive is their affordability. As an organization we believe in safety for all and these shields are part of our range of affordable flange safety shields. These shields come with a standard Guarantee of 18 months. High-Density Polyethylene (HDPE) is un-branched which makes it denser than other polyethylene. This structural difference gives thermoplastic HDPE more strength than other polyethylene. HDPE - PP Flange Guards Have been designed with low pressure and temperatures in mind.These PP - HDPE Flange Guards and acid spray shields are widely sold because of their cost effectiveness. Even though we have made these flange guards cost effective due care has been taken that Indana flange guards perform in a superior manner compared to other PP and HDPE flange guards available in the industry. 1.Minimum thickness higher than 1 mm-maximum varies depending on the pressure requirement. This is critical for a flange guard’s strength and ability to hold pressure. HDPE - PP flange guards that are below 1mm will not hold and disperse pressure properly. 2. 100% UV resistant HDPE - PP flange guards - polymers are subject to sunlight which releases ultraviolet radiation. Prolonged exposure to sunlight causes the flange guard to crack. Premature cracking of the product will cause accidents as they are tightened against the flanges. Our flange guards are UV resistant which results in a longer lifetime for the shields and reduces your overall costs in terms of product cost, maintenance, handling, and safety. 3. Secured tightening: we take special care in manufacturing the fasteners for flange guards. If a fastener used to tighten an HDPE PP shield is loose, it will lead to the shield becoming ineffective and failing. The fasteners we use are secured tightly to the flange guard resulting in zero slippage of the guards from the flanges and effective functioning of the shield. 4. 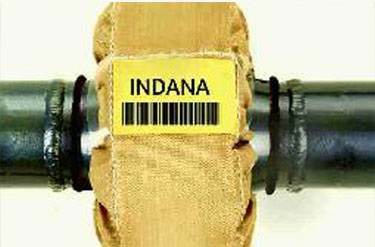 All our pipe flange guards are bar coded and marked for size and pressure. This results in effective fault finding and easy replacement in case of non-performance of the HDPE PP flange shield. 5. Reusable – If the flange leaks or fails the flange guard can be easily removed and after rectifying the problem the same shield can be reused. This can be done multiple times with the same shield. We hold annual rate contracts with several companies for supply of HDPE PP flange guards. We strongly believe in long-lasting customer relationships and are committed to delivering quality at even better flange guard prices. 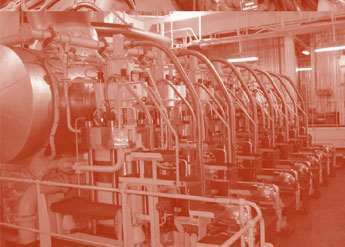 Oil fuel lines shall be screened or otherwise suitably protected to avoid, as far as possible, oil spray or oil leakages onto hot surfaces, into machinery air intakes or other sources of ignition. 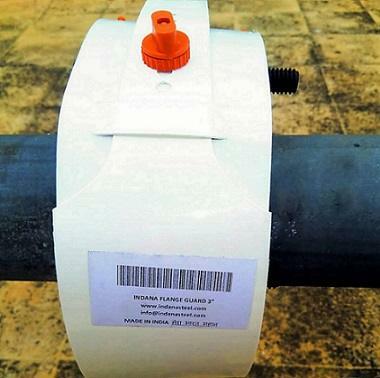 The number of joints in such piping systems shall be kept to a minimum. These shield are designed for the safe discharge of liquids that are flammable, and to prevent liquid discharge from joints on the electrical line. These Ship Spray Shields & Guards are made of multiple layers of PTFE coated fiber glass fabric with aluminum and silicone sheets stitched inside. Extreme care is taken to use material that does not support combustion and is flame retardant. The tying ropes used are also flame retardant. These flange spray guard rolls are available in 10 feet and 20 feet rolls. Please note that Flange shields are used for safe discharge of liquid and are not an alternative for sealing pipe joints. Clear type flange guards with a transparent window for visual inspection of the flange. Stitched with Kevlar and guaranteed for 24 months by Indana. Clear type shields are used for both valves and flanges. They come in two types of MOC: PVC and ECTFE. The transparent central scrim makes it easy for visual inspection of the pipe joints. This central scrim is stitched with Kevlar thread to the rest of the shield. These shields are easy to install and are greatly in demand. The locking arrangement consists of Velcro fasteners and tie cords. T joints and elbow are part of pipe fittings. 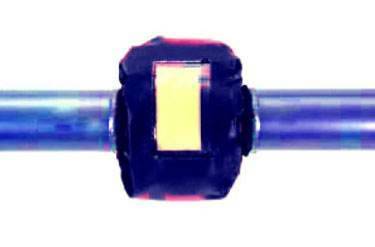 T joints are primarily used for branching or mixing fluids. Elbows are used to join puppies at angles. These are small but important parts of a piping system without which a piping system cannot function. Like most joints, these joints are also subject to leaks. A number of times these fittings are installed above man height, which makes them dangerous in the event of a leak. These pipe spray shields are essential to ensure pipeline safety. Valves are critical components of any piping system. They are used to regulate the flow of fluid as per process requirements. They are designed to handle extreme pressures. Most of the catastrophic accidents have taken place because of valve leaks. Piping valve Spray guards are used to contain these dangerous spray outs. These piping valves are also subject to extreme temperatures. The valve spray shield selection is based on the design, pressure, and temperature. There are a wide variety of valve safety shields available for the different types of valves. The most commonly shielded type of valves are ball valves followed by butterfly valves and check valves. Mumbai Office: C02-0423,MAYURESH TRADE CENTER, PLOT NO 4,SECTOR 19, VASHI, Mumbai Suburban, Maharashtra-400705. Design Plays A Critical Part In Every Flange Guard Or Flange Spray Shield In India. Most Of The Flange Leak Guards Available In The Market Are Ornamental In Nature Without Any Real. As A Manufacturer We Make Sure That Our Stainless Steel SS Flange Guard /Shield Has Been Designed With A Steel Mesh. We have been manufacturing and exporting our flange guards & flange shield to China, USA, Saudi Arabia, Qatar, UAE, Dubai, India, Abu Dhabi, Jebel Ali, Riyadh, Iran, Philippines, Poland, Germany, France, Africa, Singapore, Indonesia, Australia etc globally. As A Manufacturer Of Flange Guards, Most Commonly Used Safety Shield Or Flange Guards Manufactured By Us Are PTFE (TFE) Flange Guards, SS Flange Guards & HDPE Or PP Flange Guard. Most of the HDPE shields sold are in improper thickness. Non UV PP flange guards are sold which will degrade. Stainless steel 304/316 Flange guards are sold in fraudulent MOC of 402 202 series. Stainless steel shield currently sold in the market don't disperse the pressure as a result both lateral and horizontal spray out happens resulting in accidents and difficulty to remove the shield. HDPE shields where bolts and nuts used in fastening system do not tighten properly.As a result the shield is loosely held and in case of a leak may jump out. PTFE coated fibreglass shields in improper thickness and sufficient coverage. PTFE shields sold in single layer or double layer without any proper filler. Nylon ropes are attached too the shield for tying. Manufacturer will give you a warranty but in case of a defect will not fulfill his obligation.